Power users will appreciate the depth of info available. When you first open IPVanish, you’re presented with a quick-connect dashboard. It’s fairly organized, if a little on the bland side. There’s a big section in the middle of the dashboard that indicates whether you’re connected or not. Below that are some status updates such as which server you’re connected to and where, the time connected, the protocol used, amount of data up and down. This is a very usable interface and may be all many users need to get the job done. Moving over to the left rail you’ve got a Server List option that will appeal to power users with its wealth of detail. At the top of this section you’ve got three tabs: List, Map, Filter. 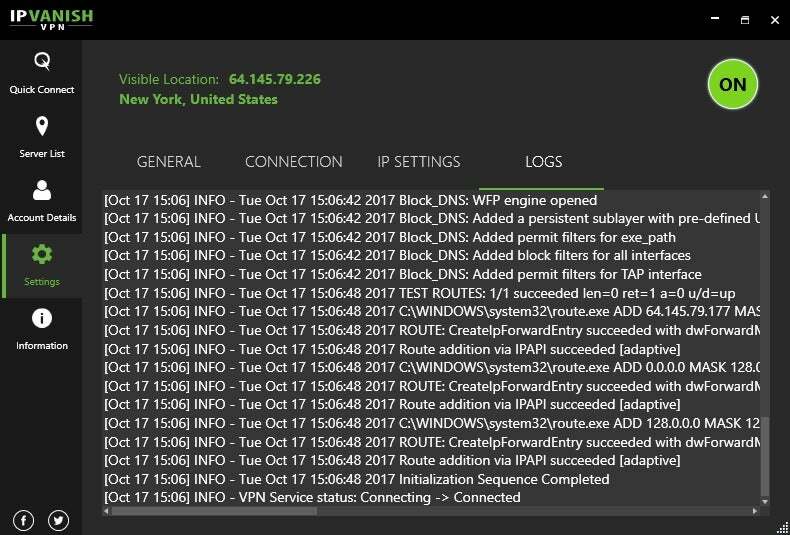 List is just a simple list of every country and the city that houses IPVanish’s connections. You can sort this list by country, response time, load, and favorite locations. There’s also a search box if you want to find items a little faster. The list section also provides the ability to drill down into each country and pick specific servers. To the far right of each country on the list, a circled number denotes the servers available in each location. Click that circle and the specific servers are revealed complete with ping response times from your physical location and the server load. There’s a lot of information contained in this Server List tab, and while that’s great for power users, the interface could be better. I didn’t think to click on the circle, for example, to get a list of servers until a company representative told me about it. Instead, I was clicking on the country locations to see if the servers would reveal themselves, but all that did was initiate a connection. 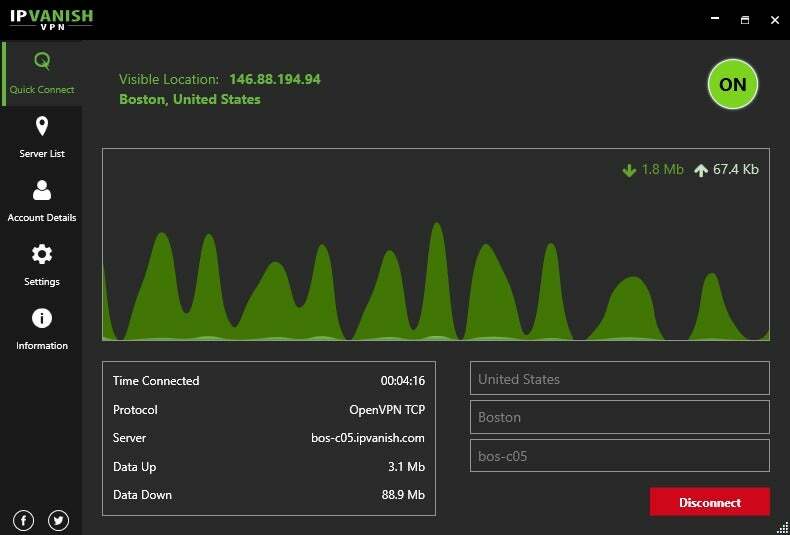 Click on Map and you get one of the more popular options for VPN interfaces. 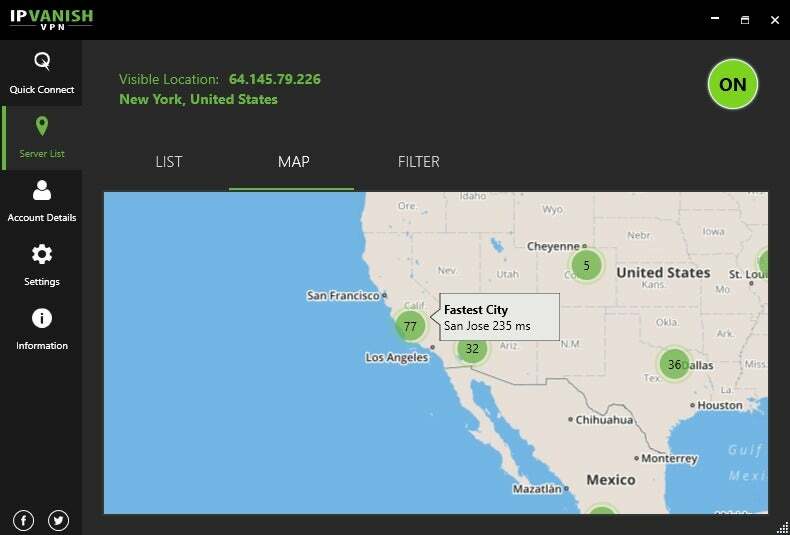 You can scroll to any location in the world on the map, click the green circle, and you’ll be connected to a VPN server in that location. The map feels a little crowded in the default size of the IPVanish window, but you can expand the entire app to get a more expansive map to scroll around. Finally, Filter lets you filter a country connection by location and server latency. The rest of the options on the left rail are self-explanatory, including Account Details, Settings, and Information. There’s not much to the settings option. You can chose to start IPVanish at boot—an option not set by default. 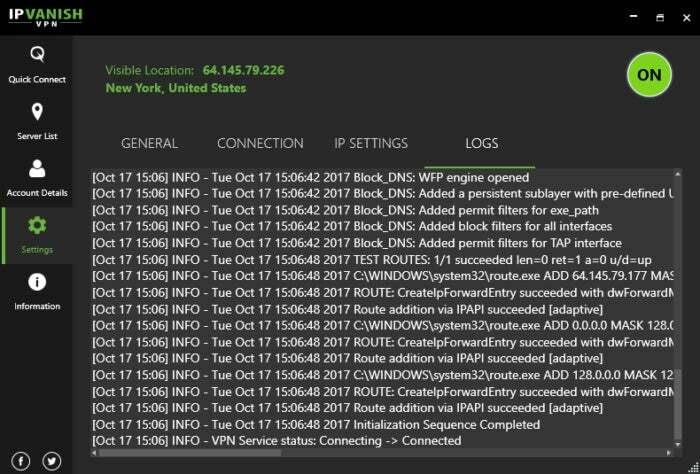 You can also choose your connection protocol, which DNS to use (IPVanish or a third party of your choosing), and the Logs for you current connection. IPVanish does not defeat the Netflix ban on VPNs like a few services do, nor does IPVanish advertise that as a feature. The company offers apps for a broad range of device support including Windows, Mac, iOS, Android, and Fire TV devices. IPVanish also offers tutorials on its site to manually set up the VPN on Ubuntu Linux, Chromebook, and Windows Phone—though the latter doesn’t really matter anymore, does it? IPVanish offers router support as well. There aren’t a ton of other features in IPVanish, but that appears to be by design. StackPath’s chief VPN architect Josh Tway told me the company is focused on building out its network with a roster of secure and fast servers. IPVanish allows up to five simultaneous device connections on one account. Despite claims to having a superior network, I can say that IPVanish has some of the slowest speeds I’ve tested. At this point, I must also remind you that this is a single experience on a limited number of machines, and your experience may vary. Nevertheless, I’ve tested numerous VPNs using this exact same setup, and I’ve rarely seen numbers this low. 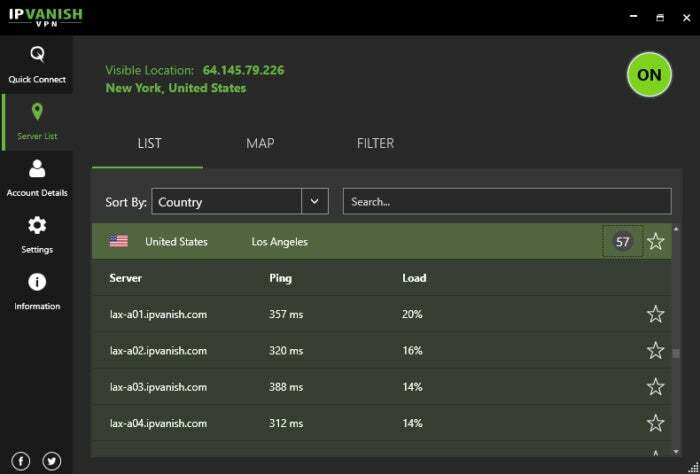 Comparing speeds across five different VPN locations, IPVanish scored an average of just 22.55 percent of the base speed using five different country connections. It was still fast enough to stream high-resolution video and for gaming over most country connections—the Germany connection was particularly good—but it was not a great result compared to other services we’ve tested. IPVanish is not necessarily set up for anonymity, but as with other VPNs, anonymity is still achievable. The company requires an email address to sign up for an account, and you can easily use an email not connected to your actual identity. Then for payment you can use the semi-anonymous method of Bitcoin, there are no options for cash. If Bitcoin doesn’t appeal, there are also the more standard options of a credit card or PayPal. IPVanish doesn’t offer a business address nor does the company provide the names of its CEO or anyone else in an executive position on its website. That’s partly because IPVanish is run by StackPath and thus doesn’t have a CEO. Jeremy Palmer is StackPath’s General Manager of the Consumer VPN division. StackPath’s mailing address is 2021 McKinney Ave.Suite 1100 Dallas, TX 75201. Even with the StackPath relationship, I’d prefer to see a roster of team members on the IPVanish site. Especially since there isn’t even a note on IPVanish’s site that indicates it’s a part of StackPath. Now StackPath only picked up IPVanish as part of its acquisition of CDN provider Highwinds in February 2017. So perhaps there will be more information on the site about its relationship to StackPath in the coming months. IPVanish is a serviceable VPN that’s based in the United States. Its speeds could be better but are still fast enough to be useful. Its desktop app is fine but could use a little improvement to make some features more obvious—such as the ability to drill down into server selection. At $77.99, IPVanish’s price is close to its competitors, but you can find higher-performing VPNs for the same price or less. 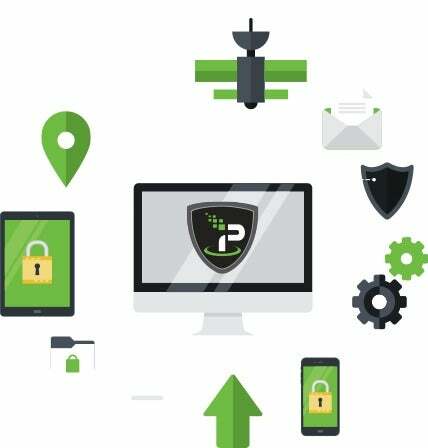 IPVanish is a U.S.-based VPN with a good app, secure connections, serviceable speeds, and enough features to please power users.